We come to your office, business or government agency to teach BLS CPR group classes throughout Sacramento. This Sacramento CPR certification course includes the latest 2016 American Heart Association guidelines on how to perform CPR and use an AED on cardiac arrest victims of all ages. Our CPR course will teach the professional rescuer the skills to recognize the sings of an unresponsive and not breathing victim and perform life-saving Basic Life Support and use an AED. Sacramento provides onsite CPR classes in Sacramento to businesses, non-profits, and other entities for groups of 6 or more. Our onsite CPR classes in Sacramento provide life saving techniques for a variety of situations. In our onsite CPR classes, you will learn to identify life threatening conditions and act quickly to respond to them. In our Sacramento BLS certification courses, you will also engage in hands-on techniques to revive and relieve people in critical situations. 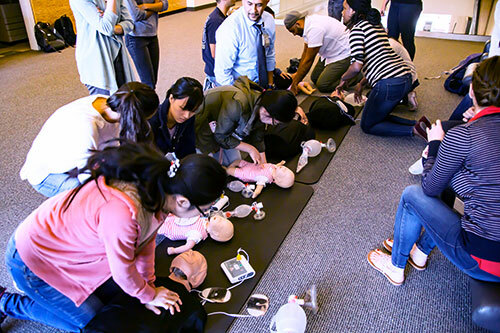 As part of our Sacramento CPR class, you’ll learn rescuer CPR for adults, children and infants, bag-mask ventilation techniques, and AED use. Our BLS certification courses will train you in the most up-to-date, AHA approved techniques, rescue breathing and choking relief for people of all ages. Our BLS course instructors are all Sacramento first responders with years of experience. We are passionate in our desire to provide the knowledge you need to react promptly and correctly in ay situation. The skills you learn in our onsite Sacramento BLS training class will ensure that you are always prepared to help those in need. After completing one of our CPR training courses in the Sacramento metro area, you will receive a two-year AHA CPR card. This certification may be necessary for some working in healthcare. Our classes are suitable for those needing first time CPR certification, as well as those individuals that need to renew their BLS certification in Sacramento. Our onsite Sacramento CPR training courses will not only refresh the basics of most CPR techniques, they will also include the most current AHA approved techniques and updates. For clean classrooms, engaging and articulate first responders as instructors, the latest AHA recommended methods and techiques, all provided onsite at your location, call us today! Call now to schedule your class! Sacramento Valley CPR offers both classroom and onsite Sacramento CPR classes and First Aid classes and certification to individuals and organizations. Our Sacramento CPR classes are taught by Sacramento area firefighters and paramedics, so you will receive training from those who practice it in real life regularly. From our Sacramento CPR training facility in Gold River, people from Sacramento, West Sacramento, North Sacramento, South Sacramento, Mid Town Sacramento, Carmichael, Arden Arcade Natomas, North Highlands, Antelope, Citrus Heights, Rancho Cordova, Rancho Murieta, Orangevale, Fair Oaks, Folsom, El Dorado Hills, Granite Bay, Loomis, Penryn, Roseville, Rocklin, Lincoln, Newcastle, Auburn, Woodland, and Davis attend our classes and get CPR certified.